Does Breathing Like Darth Vader During Yoga Decrease Stress? Sort Of. If you’ve ever taken a yoga class, you’ve probably noticed that guy who sounds like he’s moving trucks with his bare hands. Or the woman who may or may not be giving birth in the corner. 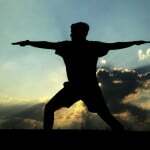 While they are actually doing the exact same warrior pose as you, they’re also working on a breathing technique called pranayama and it can get a bit, how should we put it, intense? However, with practice, it starts sounding a little less “I am your father” and more steady ocean tide followed by a soothing meditative state. It’s totally not mandatory to work on this aspect of yoga, but it does have some pretty incredible health benefits. This practice of pranayama, or breath control, has been an integral part of yoga from the beginning of yoga time—not to be confused with the beginning of time which we won’t even get into. Those first yogis realized that our breath keeps us alive, reaching the simple conclusion that if you stop breathing, you die. Not groundbreaking research, but it led to their understanding of how it also affects our quality of life. They started experimenting with the effects of quick, repetitive breaths, inhaling and exhaling out of alternate nostrils, evenly timed inhales and exhales, and constricted breathing. If only time machines existed to watch that go down. Probably not giving a damn about what they looked or sounded like, these yogis noticed things from their trials like when your breath is shallow and constricted you’re more likely to be unhealthy and less likely to reach enlightenment. Conversely, when you take full, deep breaths you seem to have increased vitality. They were just taking in what they observed and making insightful conclusions, but the modern science investigating breath and its effects fully supports their ancient findings. Fast forward to white coats and laboratories, modern research found that shallow, tense breathing—like when you’re trying to explain how to use the internet to a 90-year-old—cuts off oxygen, sending a message to our brain to panic and release those dreaded stress hormones. Our body tenses, our fight or flight reactor is triggered, and our brain continues to be deprived of crucial oxygen. Over time, excess stress increases our blood pressure and reduces our immune system’s ability to function, causing fatigue, illness, and even untimely death. It’s a wonder there isn’t a five minute commercial for its laundry list of side effects. All just from breathing. In and out. Thankfully there are proven health benefits from using pranayama to help us not die. Not only during downward dog, but also walking the dog can be used as an opportunity to practice controlled breathing. The repetition of this technique during stress-free times will give your body the memory to start using it during stressful times. By consciously inhaling slowly and fully you allow your heart rate to lower and reduce the amount of environment induced panic your body is reacting to. In a sense, you’re tricking your brain into believing you’re A-OK rather than running from a pack of wolves. Your brain gets the signal that you were just kidding about the whole stress thing and it goes back to whatever more important thing it was doing. And that’s really the point. Your body has an amazing way of taking care of itself, but it hasn’t caught up with the times to realize having lunch with your boss is not the same as sensing a lion stalking you; although it honestly feels that way sometimes. Lucky for us, some smart dudes way back when paid attention to those details so that we can remember to breathe deeply in between sun salutations or bites of a succulent bacon cheeseburger. Yoga Charge – Free Beta Videos – Your Last Morning Video!